Top 10 Best Electric Extension Boards in India 2017 – The smartest and quickest way to find the best products. Daily updated Top 10 lists. Look, Choose, Buy Smart! If a 500 rupees electric extension board saves a couple of lakh rupees, would you buy it? Of course you would, and that is exactly what an extension board with a spike guard feature does. 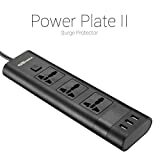 It prevents sudden voltage bursts from damaging all of your expensive electronics, including your HD TV, home theater system, gaming consoles, desktop computers and a whole lot more. So, have a good look at the extension boards in this article and choose one that will deliver convenience as well as protection. Surge protection on your extension board protects your expensive electronics from sudden high voltages, that do happen once in a while in India. 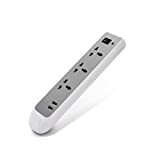 Who doesn't need a USB port handy at all times, with an extension board with built-in USB ports you will never be searching for a charger or place to charge your phone and other electronic devices. An electric extension board is an essential in every Indian household. If you have any electric appliances, a music system, a cooler, a TV or any electric device, then you will need an extension board. Generally an extension board is most commonly used around the television in the house, especially if you need to connect a music system, and a gaming console and a DVD player and other things that are centered around the TV. The problem with having more and more electrical devices in the house is that we need multiple wall sockets at almost all parts of the house. Since that is not possible, the electric extension chords solve this problem beautifully. 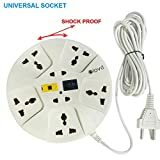 If you are using it to power a table fan or a cooler, then you do not really need to worry what kind of an extension chord it is as along as it is safety certified, has an ISI mark and is from a reliable company. However if the electric equipment is expensive, like a HD TV or a high end music system or a gaming console, then you cannot afford to buy any old cheap extension board. Then you need an extension board that is also a surge protector. 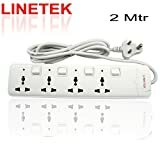 This is something that you will have to check in the specifications of the electrical extension chord. 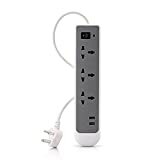 Though if you search on a website like Amazon India online, you will find a huge variety of surge protectors. Our suggestion is that you but a good quality extension board no matter what your need. After all safety is the most import thing and that is something you cannot compromise on especially if there are children in the house. 2. These extension boards have been tested and tried by many buyers already. They are a solid and reliable choice for you. 3. The top ranking extension boards in this list are updated every day. 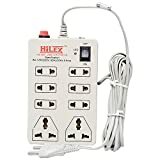 That means that not only are the bestselling extension chords featured, even the latest models are in this list. Go ahead, choose India’s best extension boards, ones that the world trusts. Socket Type: International socket which is suitable for different types of plugs used around the world. COMPACT DESIGN - The simple and convenient design adds to the smart construction. 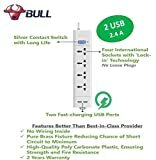 The sleek and compact design helps you store this board anywhere when not in use!Use it for powering computers, TV's, laptops, mobiles and various other electrical appliances below 1000 watt as it easily has a long service life. 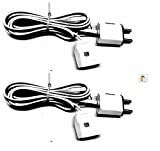 3 METER POWER CABLE - If you are worried about how you can use the spike guard away from the source of electricity, then you need not worry much as the Elove 6 Amp with a 3 meter long cord to allow you better usage. SHOCK PROOF ABS MATERIAL - ABS housing material for high impact and good chemical resistance. You are rest assured that the Elove extension board is reliable and a durable option for all your power needs. PRECAUTION - User do not use strip for heavy load equipment's like microwave oven, electric kettle , press, geyser, immersion rod etc. Can be use below 1000 watt devices as total load on the strip. When you buy an extension cord in India, then it is very important to look at the safety angle first. If you buy an extension cord that is from a dubious manufacturer, chances are that it will not meet the minimum safety requirements. An unsafe extension cord is an enormous hazard for any home. 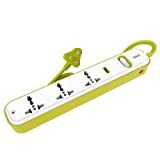 If the extension cord is not suited to take the load that it has been shown to be able to take, it might short circuit, and that can be the cause of an accident.Forget that, if the extension cord is made of inferior materials, someone using it may get an electric shock. Since one of us are technically knowledgeable enough to actually check out the parameters and ensure that the product is absolutely safe. out best bet is to choose an extension board from a well known and reliable brand. Fortunately there are many reliable and trusted brands which make good quality and safety norms meeting extension cords. A household name in India for a variety of products but mainly home electrical related products like Modular Switches Ceiling Fans etc. They are a company that very clearly focussed on quality and reliability. 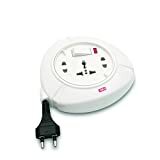 Their products are excellent, and you can check out their range of top selling extension cords and boards here. Syska has come to the forefront in recent years, and has become one of India's best known brands in the LED bulbs and electrical products space. Everyone must have seen the TV commercials featuring Irrfaan Khan. You can check out the top selling Syska electric extension boards here. A company that was established in 2002, and has grown into one of the largest brands in this sector in India. They now have GM Experience Centers all over India, and are a market leaders. Have a look at the top selling GM Extension Boards here. Connect monitor, CPU, Speakers, Laptop, Modem, TV, Sound system and many other 5A electric appliances. 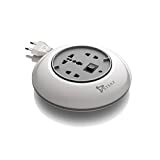 Watch the video to auto cut off connected devices and hot plug facility. Supports USB charging and USB data transfer. Earthing protection and blown fuse indicators. 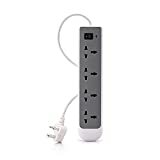 4 way Power Strip Compatible with multi plugs of Europe, Spain, Switzerland, china, india. Used for computer Laptops, tv, dvd vcd etc. Fuse protects from fire, short circuit etc. 184 joules provide long lasting surge protection.